Our essential guide for choosing a format to back up your hard drive. The amount of data we are keeping on our computers is getting silly. Gig upon gig of movies, music and valuable photos, tens of thousands of e-mails you cannot be bothered to delete. And then, your hard-drive crashes, and you lose everything. Because the truth is that many of us do not bother to back-up, but if you would like to start, here is everything you need to know. If you want to store small amounts of data, Writable CDs are fine and cheap, but if you have a large collection then you will need more space. DVDs can store up to eight times more than a CD, and a dual Layer DVD will hold around 8GB. HD formats like HD-DVD and Blu-ray discs can store up to 50GB. And of course it goes without saying, but we will say it anyway, you will have to have buy a Blu-ray or HD DVD writer to be able to write data on these discs. These HD disc writers are still not common and are very expensive, so if you have large amounts of data you might be better of investing in an external hard-drive. They are rapidly coming down in price and growing in size. Many external drives come with software allowing you to set-up automatic back-ups at times and days of your choosing. Choose also whether to back-up all or just some of your files. 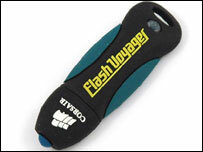 For a lighter, more robust, shock resistant option, go for a flash drive. More expensive per gigabyte, but also more accident-proof. How about storing your data online? Many companies are offering online space for a monthly fee. Very handy if you travel a lot and need to access your data from anywhere in the world. But uploading is slow, so it is best to limit it to essential and smaller files. And bear in mind that if your membership lapses, you could lose your data. There are also programs available that can take a snapshot of your hard-drive and save it as is. So if anything goes wrong, you can just restore using the disc image. But make sure you save this file on to a separate drive. After all, if your hard-drive crashes, any back-up you have stored on it will be toast. The latest operating systems - ie both Vista and Leopard - come with an automatic back-up tool. Vista can automatically back-up your data on to a server and on to another drive and the business edition will give you the option of backing-up your entire system. Leopard's Time Machine can also constantly back-up data, as it is always working in the background. But you do have to buy an external drive to be able to use it. And Windows XP also comes with its own data back-up facility but it is a real pain to use.